A little update on the deskbar-story. 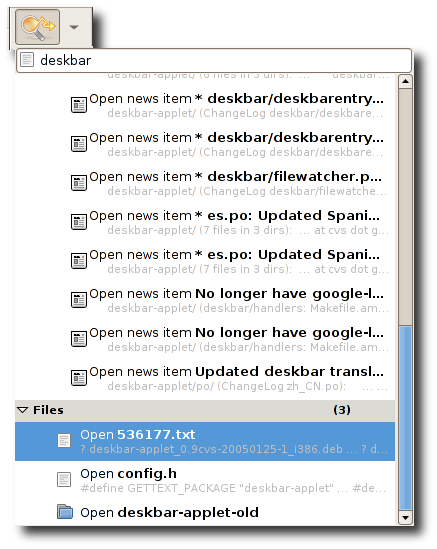 We managed to introduce the incredible new UI in the beta releases of deskbar (2.13.9x series). This was thanks to the hard work of Mikkel Kamstrup, and the moral support of Nigel Tao. They both have nice juicy screenshots and screencasts made with the 1337 tool byzanz. They also presents the new icon, with even more Tango love.. Here are new ones just for you ! As always, the more we receive feedback in the bugzilla, the more deskbar will be rocking at the official gnome release. We also need feedback about the new UI, could it be enabled by default, good/bad points, etc. 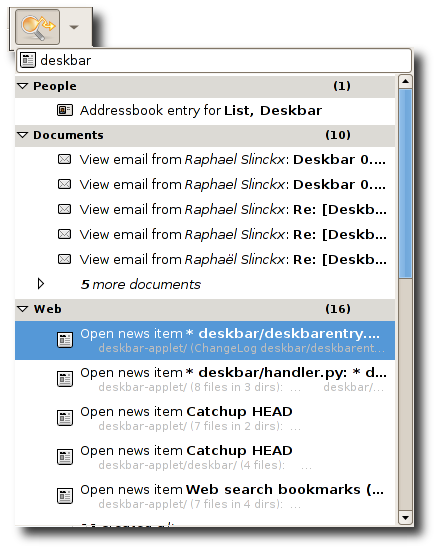 Come and discusson IRC (#deskbar on gimpnet) or the mailing-list. I have made very small changes, cleaned up the code, and removed useless stuff. I doesn’t have any new features.. This entry was posted on Saturday, February 4th, 2006 at 18:18	and is filed under Planet Gnome, Software. You can follow any responses to this entry through the RSS 2.0 feed. Both comments and pings are currently closed. Great job you guys on the latest deskbar. I’ve been checking the cvs for quite some time now. When I first noticed the new UI the deskbar panel indeed didn’t focuse when the key was pressed, but at least the UI was working on some level. Then later from cvs I got some error dialogs from python I think… And now the new IU is simply disableled in Preferences dialog. Why is that ? I’m running FedoraCore4 updated on GNOME 2.12.1. python-2.4.1. Is there any way I can enable the new UI, just to play with it or something ? You need a cairo-enabled pygtk to use the new UI, which means a > 2.8 pygtk compiled with cairo support. Hey, the second screenshot shout point to http://raphael.slinckx.net/images/deskbar-applet-11.png . Looks very nice, but it seems like a lot space is wasted by the repeated ‘View email from’ and ‘Open news item’ prefixes which push the actual titles off to the right. The icons and headings already give a hint as to what each item is, and the titles themselves contain the most useful information, so we should see as much as them as possible. I compiled pycairo and pygtk-2.8.4. It works now. The FOSDEM-weekend was great and and I now finally have the deskbar-applet installed. Just terrific stuff! I was just playing with FC6 and love your investment panel addon. I was wondering if you could tell me how I could get investment to take fractions as an amount. I own a few ETFS and instead of owning 120 shares of something, I might only own 118.7560 shares. Any help would be appreciated. Hello, the Investment applet is very useful, for learning proposes, but i can track a short sell. Maybe useful add this function. Pd: A short sell, in few words lets you win when the costs down. After upgrading to FC6, the gnome stock tracing applet was replaced by this one. Unfortunately, it does not work. I get a grey square even after adding stocks in the preferences. Any ideas how I can trouble-shoot? I am having the same problem with Invest as Greg Douglas. I am using Ubuntu 6.10. The applet works just fine under Ubuntu 6.06.
same problem as above : cannot make work the applet invest… is there any doc somewhere ? Thanks for Invest applet(2.16.1). Just a minor nitpick. In the drop-down stock list view, the delta of a stock is displayed as ‘%’ instead of actual currency value. eg. INTC: 20.60 (-0.24%) where in face -0.24 is the actual value in US$. I am having the same problem as Greg Douglas, punkybouy and poleta33. I installed it in the panel on my Ubuntu Edgy amd64 computer with Gnome 2.16.1. I added some stocks and number of shares, but it doesn’t display anything. I can right-click on it and then on “refresh” but it still doesn’t show anything. Is there a fix? Am I doing something wrong? Is there an alternative panel utility that will work? Thanks! Thanks for the cute applet. Could you consider adding one more commission column based on traded value? Some kind of help/manual explaining all the numbers/concepts would be great, as they are quite confusing, especially when there are no dimensions (i.e. no $ sign). It would also be great if it was possible to customize the data source (Yahoo has very few graphs from OMX). Actually it would even suffice to open the graph in a web browser directly (e.g. maintain a customizable URL of particular stocks and use it to open page in a browser), especially given than todays sites offer even interactive graphs with news and analysis tools on the same page etc. i checked that i can get the quotes on the same computer with firefox from yahoo. what could be wrong? what could i change to make this nifty application working? thank you – seems neat! Same problem as andrew u.
I am using the same invest applet with another computer with Mint 7 and it works. But with ubuntu 8.10 or 9.04 no way.